A volunteer walks the length of the trail with a 23kg backpack. Those thinking of walking off holiday excesses can now plan a route from the comfort of their sofa, feasting their eyes on the beauty of the longest trail crossing the North York Moors by viewing 360º panoramic images on the internet. 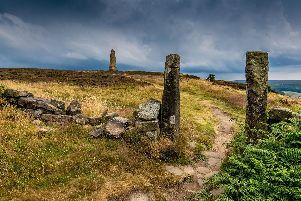 The entire 109-mile Cleveland Way National Trail is now live on Google Street View following a mapping exercise by the North York Moors National Park Authority using a special elongated camera and computer equipment mounted in a backpack as part of the Google Trekker loan program. It took volunteers from the Hardmoors ultra-running team the equivalent of 13 full days within a seven-month period to walk the length of the trail. Capturing the images took time as the team could only use the Trekker on fine, bright days and they needed to ensure the camera kit remained upright as they walked slowly along, even when faced with low branches and challenging terrain. The image sequence has since been stitched together to provide viewers with panoramic vistas right along the Cleveland Way, which stretches from Helmsley across the North York Moors to Saltburn-by-the-Sea before re-entering the National Park and then following the coastline down to Filey. Visit www.nationaltrail.co.uk/cleveland-way/google-trekker to find the Cleveland Way on Google Street View.